Set on the banks of the Mutlumuvi Riverbed, the elegant 8-suite (16 bed) Rhino Post Safari Lodge is built using natural materials of stone, thatch & canvas. The utmost care was taken to minimise the environmental impact of the lodge. No concrete was used in the buildings and battery power is used for lighting. A special indigenous reedbed system processes the bathroom waste, and other waste is sorted and recycled wherever possible. 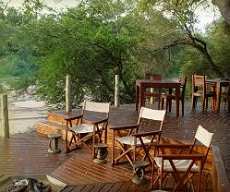 Both the swimming pool & lounge overlook an active waterhole in the riverbed. The lounge, with its extensive wine cellar, fireplace and bar provide a perfect setting for an afternoon or evening sundowner. Stilts raise the spaciously appointed suites, allowing guests to view the riverbed with ease from the bedroom, bathroom and private wooden deck. 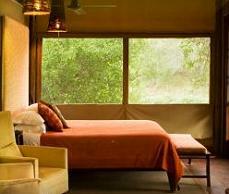 The suites are set out in open plan style with wooden floors, thatched roofs, canvas walls and a ceiling fan. Each en-suite bathroom includes a deep, freestanding bath. "his" & "hers" basins, a separate toilet, and an outdoor shower. 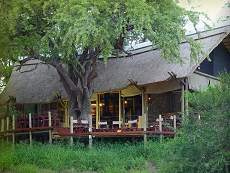 Rhino Post Safari Lodge also offer walking safaris and evening game drives in KNP. 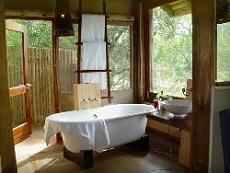 Rhino Post Safari Lodge is located inside the Kruger National Park, ?? km north-east of Skukuza Rest Camp.